As business and social lives become more casual, there’s a danger that professional communications are less clear and effective. To make sure you don’t ruin an opportunity by making a bad impression, Jennifer Bridges, PMP, has these phone etiquette tips. Jennifer opened with the obvious: we’re living in a mobile world where communications have taken shortcuts such as emojis, tweets and texts—turning conversations into soundbites. While there is nothing wrong with what Jennifer referred to as “on the go” communications, without a foundation in the fundamentals of business etiquette, your meaning can be misconstrued as disinterested, rude or worse. Therefore, Jennifer felt a refresher course in telephone etiquette was in order. She also added a bonus section with etiquette for conference and video calls, too. It’s important to maintain a similar level of professionalism when communicating via online project and collaboration tools. Schedule a time for the call that works for all involved. Block out that time on your calendar, so there are no interruptions or conflicts. Agree on a purpose and outcome for the call, so everyone is working towards the same ends. Provide prop materials if needed, so information that is pertinent to the conversation is at hand. Send reminders in order to make sure that the call doesn’t slip through the cracks in someone’s busy calendar. Start the call on friendly terms. Like opening a speech with a joke, it’s a way to set the tone and engage the person or group. Stay on time. Others are as busy as you; if the meeting is a half-hour, keep it at that to respect all involved. Follow an agenda. It’s the best way to stay on track and make sure you address everything that’s important. Wrap up with follow-ups and action items to make sure after the call everyone knows what they’re responsible for accomplishing. Don’t be angry, whether you’re starting the call or were invited to participate it in it; your tone will turn people off and ruin any chance at productivity. Again, don’t show up late! Whether it’s your call or another’s, because that’s just rude. Don’t use slang; it’s unprofessional and can be disrespectful. Don’t disturb those around you by having your call in the middle of a busy work station; instead, find a quiet and private place to make the call. Don’t show up unprepared. Don’t fumble about searching for documents, or end the call early and reschedule. Don’t invite anyone without their express permission. Imagine how you’d feel if a call was sprung on you without knowledge. Don’t record a conversation unless you have everyone’s approval. It’s not only poor etiquette—it’s illegal. Make sure you have a strong internet service. The last thing you want on a business call is to have it interrupted or be glitchy. Make sure that all those invited on the call know how to access it. Whether that’s through a third-party service with an access code, or if it’s via software, then make sure they have it downloaded and can use it. Conference calls are usually not on screen, but video obviously is, so no doodling or making goofy or bored faces. This is an important tip when you’re planning a webinar as well. Pro-Tip: Once you have the phone etiquette down, you’ll also want to turn up the volume on your likability by making a good first impression. Smiling over a video chat and being attentive are two ways to do so. Take it Further: If you’re managing a project and regularly communicate with the same parties, be sure to establish a project communication plan. Today, we’re talking about telephone etiquette for successful business calls. Well, today with mobile living and social lifestyles this has become a lost art in some cases. On the go communication by emojis, likes, posts, tweets, texts has us accustomed to speaking in sound bites. So, this can actually impact our telephone etiquette and the success of our business calls. So, in today’s whiteboard session, I wanna share some quick reminders of do’s and don’ts as well as some bonuses for conference calls and video calls. So, let’s look at some do’s. Number one, remember to schedule a time with the person you’re going to have the call with or the group of people, and be sure to block the time. Sometimes people schedule the call and they forget to block it on their calendar, and then if other people are scheduling calls on their behalf can sometimes double book calls. So, we want to avoid that. You also want to agree on the purpose of the call and the outcome. Like why are you even having the call and what do you hope to leave knowing or deciding? Also provide prep materials in advance if appropriate, maybe do they need to review some spreadsheets, or numbers, or reports? Also be sure to send reminders. Again, with “on the go” lifestyles people are a lot of times not in front of their email and they may forget. So, by sending a reminder it helps just remind them that the call is scheduled. Also start the call friendly. I don’t know if you’ve ever participated on a call and maybe someone is rushed or maybe you’re rushed, and you have things on your mind and maybe you’re frustrated from something that happened before the call started and you bring that energy in. It’s just not a very good way to start the call. So, as your reminder is be sure to give yourself time to disperse any energy or any frustrations before you start the call. Also, when you start the call review again the purpose of the call and being mindful of how much time. If it’s a 30-minute call, keep it to a 30-minute call. If it’s a one-hour, leave it at a one-hour. Also stay on time during the call. And then be sure to follow the agenda. Then wrap up that call with a follow up, see if it’s appropriate to schedule another follow up call while you have a person or other people on the line, and also leave with action items. What are people supposed to leave doing? Many times people who attend calls don’t like to go to them because action never results. They’re like no one has taken minutes or tracked what is supposed to come from the call. So, the don’ts are, again, don’t answer a call angry. Don’t make the call angry. Don’t answer a call angry. That just sets up a bad tone from the beginning. Also, don’t show up late. If this is your meeting, or if you’re a participant in the meeting, some people say if you show up on time you’re late. So, be sure to be there early and review materials and why the purpose of the call. Don’t use slang. Many times today, people are working in teams where they’re located all over the world. So, when we begin using slang, other people may not understand what you are talking about. Also, don’t disturb those around you. Again, going back to the mobile lifestyle, maybe we’re taking calls maybe in shared locations, or maybe it’s not normally in our office location. So, just be aware that if there are other people around you, because if you’re using headphones or something like that, you don’t wanna disturb those around you. Also, don’t show up unprepared. Again, if you take the time to compute how much it costs to have a meeting, whether it’s your time plus the other person’s time, also say if you’re on a project, that time adds up and it costs people. So, you want to show up being prepared for the information or the decisions you need to bring to the table. Also, don’t invite others without an okay. You know, sometimes there are certain things that you have to talk about under a confidentiality agreement, or maybe it’s just certain things that’s not appropriate for other people. So, if you want to invite other people just make sure it’s okay. And don’t record without approval. This is actually illegal in some cases, and maybe even most if not all. So, if you record the session just make sure to announce and make sure everyone is aware that you’re recording. And also as a bonus today, more and more, again with the mobile lifestyle living and work environment, we do a lot of conference calls and video calls. So here are just three things to remember. One, confirm that you have a strong internet service. So, if you’re doing these calls, they’re typically by internet, so if it’s internet service or wireless service make sure it has enough strength to make the call otherwise it’ll end up being choppy. Also ensure people know how to access. I mean, many people have been doing conference calls and video calls for a very long time and then for some people it’s new to them. They may not realize that you have to download an app, or download a software, or how to get dialed in or called in. So, just make sure everyone is aware on how to get on the call because that can really hijack a meeting if you’re trying to get people on the call. Also be aware of tone and facial expressions. Specifically for conference calls, the tone…maybe you’re making a face or some tone comes across that maybe the recipient perceives that maybe you don’t intend. And also for video calls your facial expressions can carry as well, so just that can impact the receiver. So, these are just a few quick reminders and bonuses, and if you need additional tips for telephone etiquette to make your business call successful, then visit our website at ProjectManager.com. 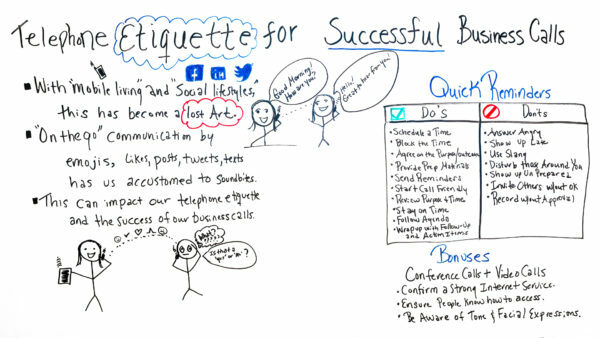 The post Phone Etiquette Tips for Successful Business Calls appeared first on ProjectManager.com. Next Avira Techblog: Want a Tiger Woods Comeback? All It Takes Is the Right Mindset.